You can be a Kitchen Pro! Here’s the place we can show the most innovative and off-the-hook kitchen appliances we’ve come across. Our goal is definitely to show creative new approaches to the core set of basic appliances, but also the new green machines, the tiny space-saving models, the whiz-bang techie toys and whatever else we feel deserves the showcasing. Kitchen appliances have never been this cool! Why are hot water dispensers common in Asian countries but practically non-existent in the West? This hot water dispenser actually heats a cup of water FASTER than a microwave, and takes up a fraction of the space. For those of us that enjoy hot beverages, or just want hot water available for oatmeal or other instant hot foods, this product is perfect. 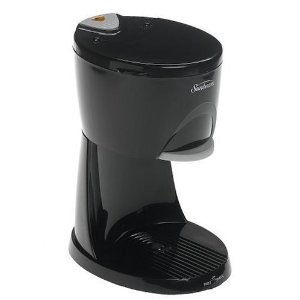 Instead of keeping a large amount of water hot over time like a thermos, this heats up 16 ounces of water on demand with a heater like that in a coffee maker, and shuts off immediately after the water has been heated. Feeling like you want a quick cup of tea or a hot chocolate? Then you need one of these! 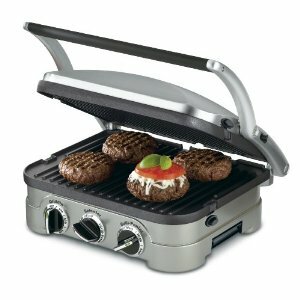 Even better than the now passe 4-in-1 Griddler is the shiny new 5-in-1 Griddler. It is a contact grill, panini press, full grill, full griddle, and half grill/half griddle. It adjusts to varying thickness of burgers, sandwiches, etc. thanks to it’s wide panini-style handle and hinged floating cover. The base has two temperature controls to adjust your cooking temps. Removeable nonstick grill and griddle plates allow for easy cleaning and easily changing the cooking surfaces. Cool huh? 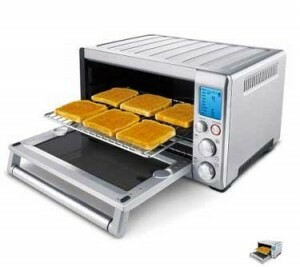 Is this toaster oven the best? We have not tried it, but there is no doubt that it looks impressive. This imposing toaster oven earned the highest possible rating from the Hammacher Schlemmer Institute because it quickly cooked chicken, pizza, and cookies and maintained a constant cooking temperature. The Best model has nine presets, more than any others as far as we can tell, each designed for a specific food (pizza, bagels, cookies). The oven suggests the ideal cooking temperature and cooking time for each and will automatically adjust the heat to get the best results. This 1800-watt oven broils, cooks with convection, and defrosts with just the touch of a button. 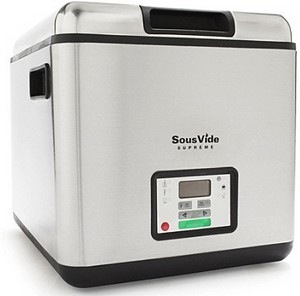 The SousVide Supreme Water Oven is a thermostatically controlled, touchpad enabled, slow cooker for vacuum sealed foods using water to deliver perfectly cooked fish, vegetables, and other sealed food items. This product is the result of decades of tweaking by top chefs. The SousVide Supreme Water Oven cooks sealed food at exact predetermined temperatures for perfect and consistent results. Vacuum-sealed food keeps in the wonderful flavors and nutrients that are normally lost during the cooking process. The pressure also encourages more effective and quicker marinating, naturally enhancing the taste and aroma of your food using even less seasoning than usual. This dishwasher is made for a commercial kitchen and really has it all. From top mounted controls to standard 20×20 inch racks it even has a deep-well scrap basket located on front of machine. Adjust-A-Peak feature allows user to adjust conveyor speed when various results are desired. Full automation activates sections only when rack is present and shuts down conveyor when no rack is present. Serious cool and safe to us! 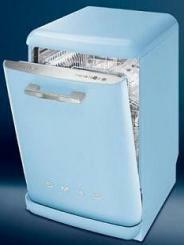 This cool 50′s style dishwasher from Smeg is available in a freestanding or integrated version. It’s curvaceous lines, bold handle and brilliant colours match the refrigerators – tangerine, lime, red, pink, light blue, panna (cream), black and silver frost. 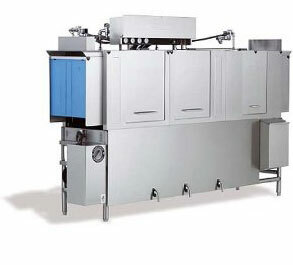 This dishwasher features concealed controls for 10 programs and 5 water temperature choices. It washes 14 place settings in 15 liters of water at just 35 dB. Style with modern convenience – Wow! Copyright © Kitchen Pro. All Rights Reserved.